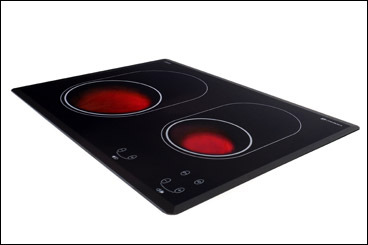 "Cooking with gas under glass"
The future that began in our households 25 years ago, with the replacement of the old steel stoves/hobs has now found its way into motorhomes with the Dynaxo-Gas-Ceramic-Cooker. KCT is sure, the old gas steel hobs, which are installed in the motorhomes for more than 45 years are antiquated as much as the steel hobs in our kitchen at home. No unshielded flame, but “annealing” of the gas through a catalyzer surface. Due to this, there is about 20% less consumption of gas. More than 30 % less pollutants in the waste gas than conventional hobs with an unshielded flame through a higher combustion temperature. 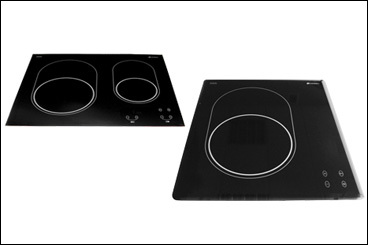 You can order the Dynaxo-Cooker with 1 or 2 hobs as well as all necessary installation materials directly from our retailers. For this product KCT offers direct sale and service for end consumers. For more information and technical details see our catalogue. Please ask our retailers for installation costs, if you purchased the cooker directly from us, please ask us. Normal insulating windows can burst when reaching 4000 m above sea level. The reason therefore is a lack of air pressure, for example on the high roads in Peru. We tested our tempered safety glass windows and even under these circumstances you can rely on the KCT-windows. - Infinitely variable opening and one-hand operation offer more convenience and security during your adventure trips. Our armor plates provide additional protection. Paintable to your custom colour the KCT windows fits seamlessly. With our KCT-tempered safety glass windows you can cope with each pass summit around the world. There are always sufficient reserves of strength as we tested the them up to 11,000 meters.